An out-of-control Dark Knight? A gun-toting Alfred? A handsome Harvey Bullock?! Batman: Earth One isn't the Dark Knight you know... and it's all the better for it. Today marks the official release of BATMAN: EARTH ONE VOL. 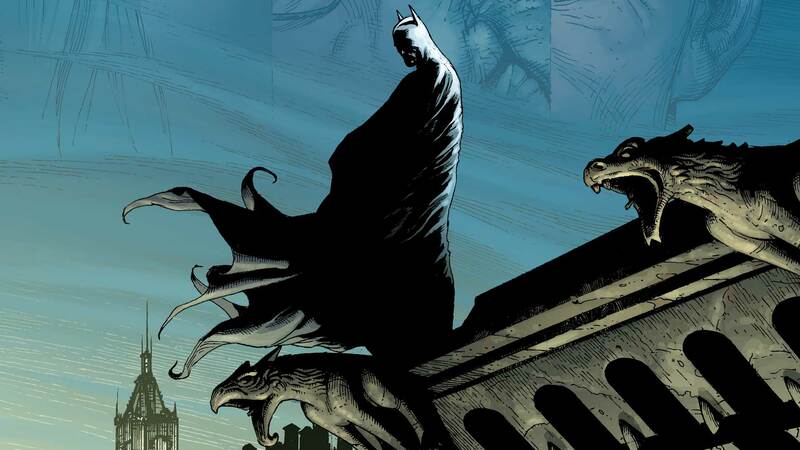 2, the second installment of Geoff Johns and Gary Frank’s reimagining of the Dark Knight legend. If you’re familiar with the Earth One books, you’re probably already looking forward to it. But if you’re new to this unique line of original graphic novels, all you really need to know is that the Earth One books offer new original takes on some of the most beloved characters in the DC Universe. They’re also some of the most new reader friendly comics that we publish. It’s an original graphic novel, so you can get it anywhere that sells books and there’s no need to come back month after month to grab the next issue. You don’t need to be familiar with any other Batman or Earth One comic. You don’t even need to have read the first volume to enjoy the second. In short, you can pick it up, read it and get a complete Batman story written and drawn by two of the most popular and critically acclaimed creators in the business, making it a great first comic for anybody. Of course, none of this means you have to be a new reader to enjoy Batman: Earth One. Far from it, actually. What makes the Earth One graphic novels so great is how they make a familiar story feel fresh and exciting. Even more interesting is the way that Batman: Earth One does it. Johns hasn’t made Batman a steampunk adventurer, a pirate or a vampire (though if you’re hoping for that last one, Bruce Timm has you covered). In fact, he’s kept most of the familiar Batman elements in place: Batman is still a billionaire named Bruce Wayne, he’s still assisted by Alfred Pennyworth and Jim Gordon and he still fights villains such as the Penguin and the Riddler. The changes Johns and Frank have brought to the character are a little more subtle, but still manage to be profound. How do they do this? Well, read on as we look at five important differences in Geoff Johns and Gary Frank’s Batman: Earth One. In his blurb for Vol. 1, Brad Meltzer points out how for the first time in a while, you can see Batman’s eyes. He’s right about this, and about what a surprisingly big change this is. We’re not used to seeing Batman’s eyes and seeing them in Earth One, quite possibly for the first time for many readers, can be very unsettling. But it also gives us a clear window into what Batman’s feeling at that moment. When he’s scared or startled, you know. When he’s angry, that emotion is right there on the page. It gives all of Batman’s fights and confrontations a little more punch. Of course, that’s only one of the changes to the suit. It also has a slightly different design, and bucking recent tradition, is largely spandex and doesn’t include body armor, something which proves to be a key point in Vol. 2. One of the bigger changes in Batman: Earth One is with Alfred. While he’s still Bruce’s butler on paper, he’s far from the genteel, always-at-the-ready manservant that we’re accustomed to seeing. Rather, Earth One’s Alfred is a rough-and-tumble former Royal Marine whom Thomas Wayne initially hired to run security for his mayoral campaign. While Alfred does still help maintain Wayne manor and assists Bruce when he’s operating as Batman, the similarities pretty much stop there. This Alfred is into the sort of tough love that leaves bruises. He understands Bruce’s mission, but he doesn’t always agree with it and he’s not afraid to tell off or even insult Bruce when he feels the situation warrants it. He also doesn’t share Bruce’s “no killing” policy, something that’s made clear in Vol. 1 and then further enforced in Vol. 2. It’s a take on the character that has proven to be influential even outside of comics, as you can definitely see shades of Earth One’s Alfred in TV’s Gotham, in which Alfred is also a former Marine with formidable combat skills. Jim Gordon and Harvey Bullock are still two largely good cops fighting against the swell of corruption found within the Gotham City Police Department, but Johns and Frank have brought some significant changes to these two iconic characters as well. Gordon is still a detective when the story begins and is a bit downtrodden. But the biggest change is to Bullock (whom you see above). He’s far from the overweight, scruffy tough guy you see in other comics, and is instead a former reality star who just transferred from LA to Gotham. In a nice little role reversal, Bullock is actually more of the idealist when the story begins, but Earth One isn’t quite so black and white and these two cops never fall into simple “good cop and bad cop.” By the end of Vol. 1, Bullock’s fallen into despair and Gordon’s gained the fire that he has in Gotham, Batman: Year One and other stories set earlier in his career. Well, you should probably just discover that one on your own. Along with his suit, allies and enemies, Batman: Earth One makes some pretty key changes to the Dark Knight himself. While we’re used to seeing Batman as a brilliant detective and unsurpassed martial artist with an arsenal of seemingly limitless high tech tools, that’s definitely not what’s on display here. This Batman is young and sloppy. He makes mistakes, loses fights and barely looks like he’s in control. Admittedly, part of this is because we’re seeing him early in his career, but the real difference has to do with the man behind the cowl. Earth One’s Bruce Wayne is a lot different than most other takes on the character. He’s impatient and a little too quick to action. Where traditionally Bruce Wayne spends years traveling the planet getting training from some of the world’s greatest martial arts masters, you get the sense that this version of Bruce maybe got a couple years of training from Alfred, and that’s about it. It’s doubtful he’s ever seen combat prior to putting on the suit, and when we first meet Batman in Vol. 1, it shows. In Vol. 2, Gordon calls him out on his terrible detective skills. To his credit, Bruce does seem willing to learn, but nevertheless, he’s a long way from being the efficient and effective hero that we’re accustomed to. It makes every scene where he goes into action very suspenseful and more than a little frightening because we have no confidence at all that he’ll succeed. Of course, when he does, the thrill we feel is that much greater. It’ll be interesting to see where the series goes from here. Vol. 2 plants some tantalizing seeds that one hopes will get a chance to grow in future adventures. What do you think? Have you read Batman: Earth One Vol. 1? Do you plan on reading Vol. 2? And do you prefer alternate universe tales that stick pretty close to the familiar like the Earth One books, or that present a drastically different take on the universe, like what we’ve seen in some of the Elseworlds comics? Let us know your thoughts below! Batman: Earth One Vol. 1 is now available as a hardcover, softcover and a digital download. Batman: Earth One Vol. 2 comes out today and is available as both a hardcover and a digital download.